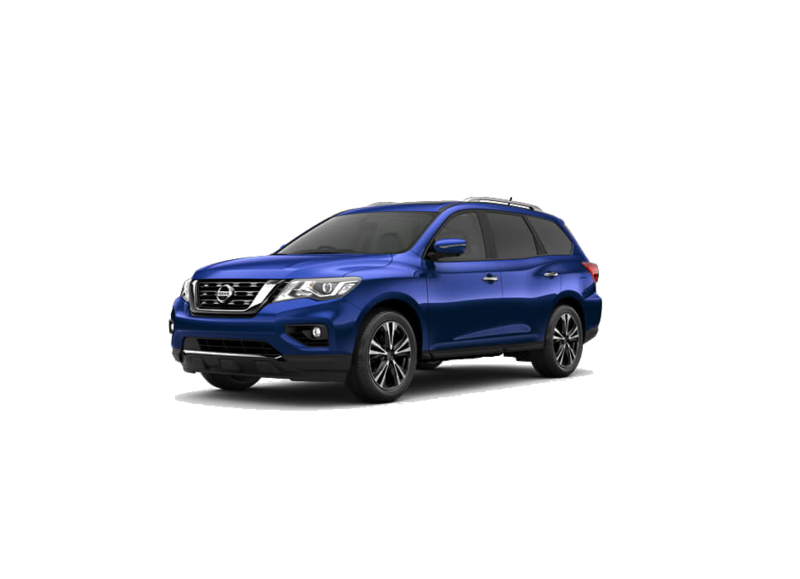 NISSAN PATHFINDER. NEXT GENERATION FAMILY SUV. 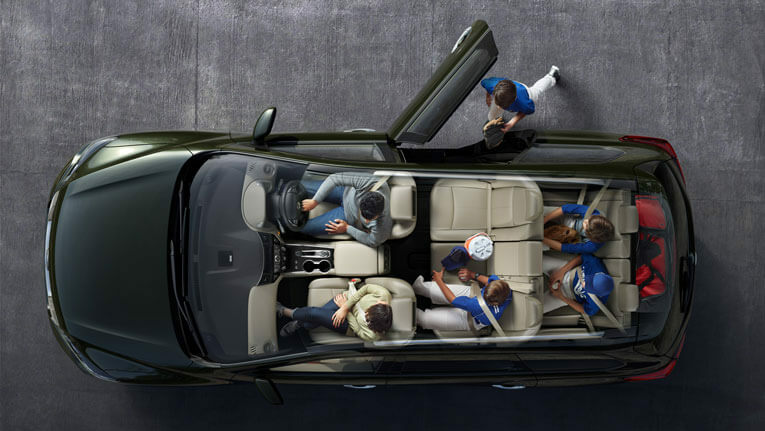 With unrivalled space and superior comfort, the 7-seat Nissan Pathfinder is the family SUV that’s going places. 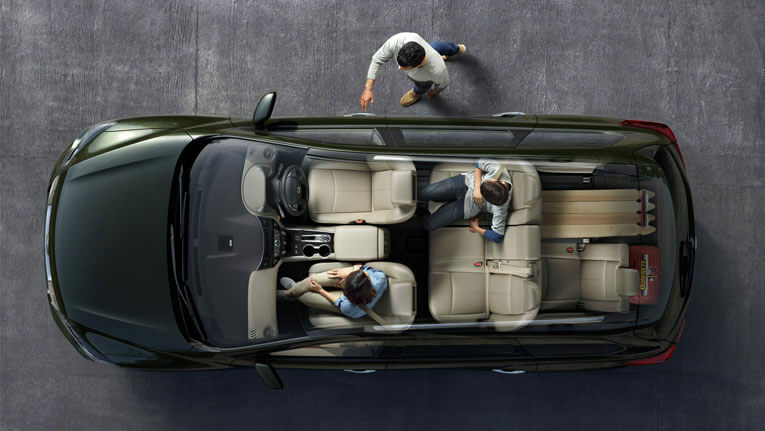 Its clever design and effortless technology ensure that every member of the family is ready for adventure. 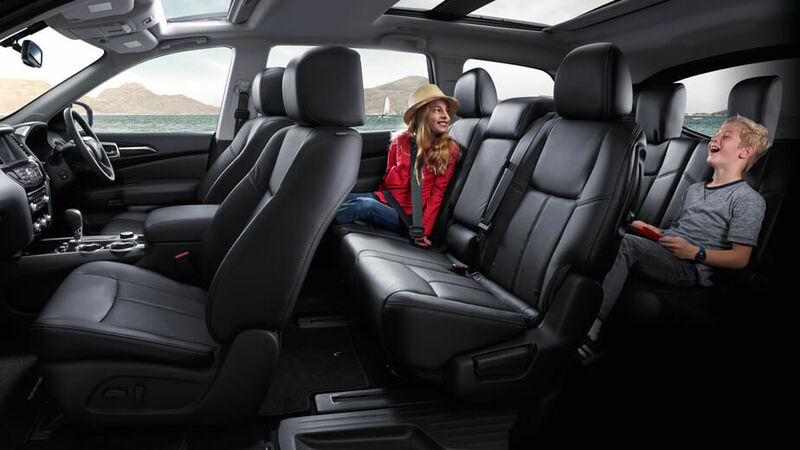 Comfort is a priority in the Nissan Pathfinder. 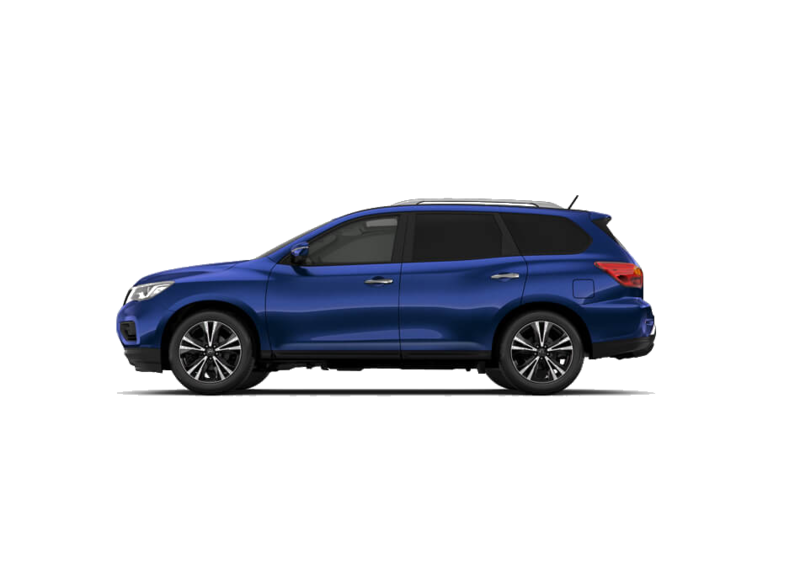 As well as boasting 7 adult sized seats, it features tri-zone climate control, large windows throughout and a panoramic glass roof* that brings natural light and scenery to your ride. *ST-L and Ti models only. 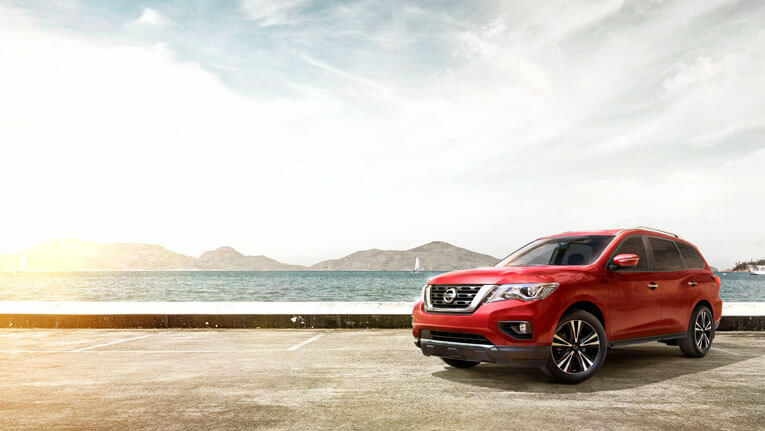 The Nissan Pathfinder sports some seriously impressive touches specifically designed with the driver in mind. Unlock the doors and start the engine with the push of a button, without even taking the key out of your pocket. 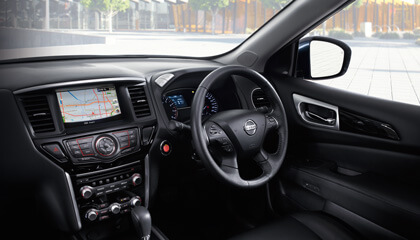 There’s an 8” touch-screen, with satellite navigation with traffic monitoring*, Bluetooth® connectivity with voice command for audio streaming and hands-free phone use. Add to that the 8-way power adjustable driver seat, driver position memory†, heated* and cooled† front seats and plush leather accented black or ivory seat trim^*, and you’ve got a vehicle you’ll just love to drive. *ST-L and Ti models only. †Ti models only. ^Leather accented features and upholstery may contain synthetic material. Hands full? We’ve got you covered. 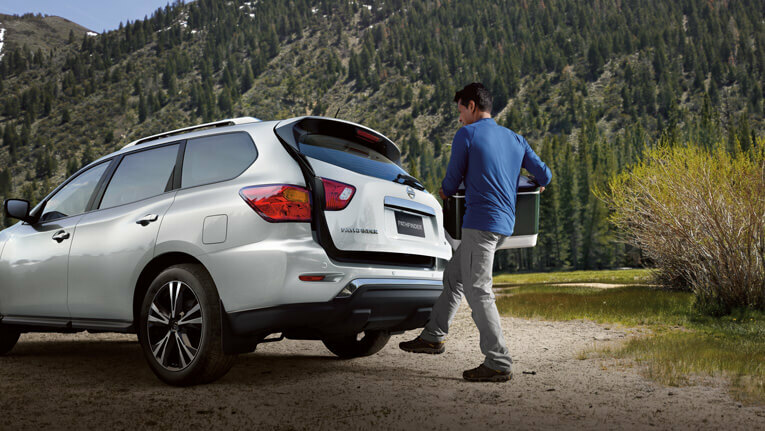 With the Intelligent Key® in your pocket, just kick your foot under the rear bumper, and the Pathfinder Ti's motion activated tailgate will automatically open to give you easy access to the versatile interior and cavernous cargo space. 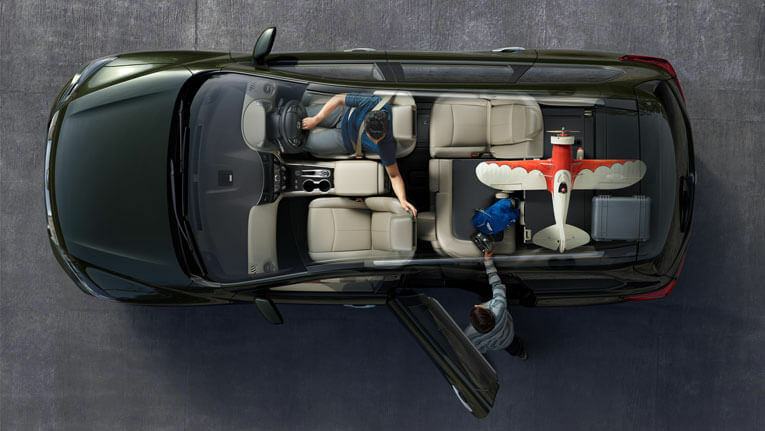 With so many possible seating and cargo configurations, the Nissan Pathfinder can handle almost any family need. 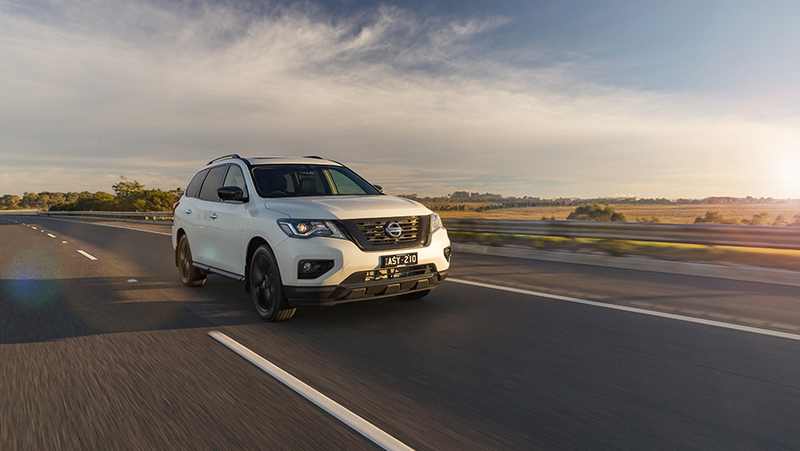 Whether it's seven people, or just two people and 2,260 litres of load, the Nissan Pathfinder is primed and ready for your next adventure. 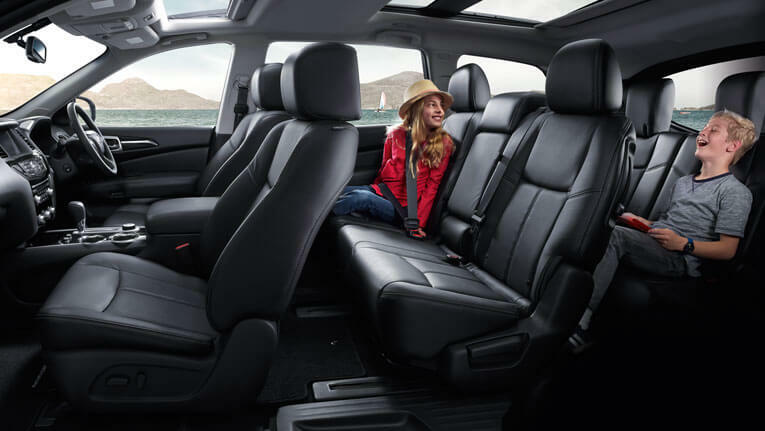 The innovative EZ FlexTM seating system, featuring Latch and GlideTM Technology, is designed to get your family in and out with the greatest of ease. Now it's a cinch to access the 3rd row - just lift a lever to activate the 2nd row seat's slide and tilt down function. 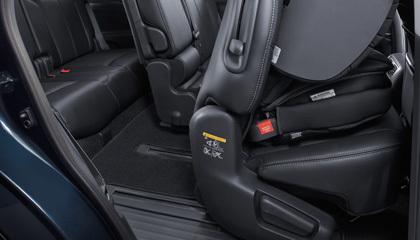 Most innovatively of all, you can do this without the hassle of having to remove your ISOFIX-compatible 2nd row child seat, which remains securely anchored as you move the row back and forth. 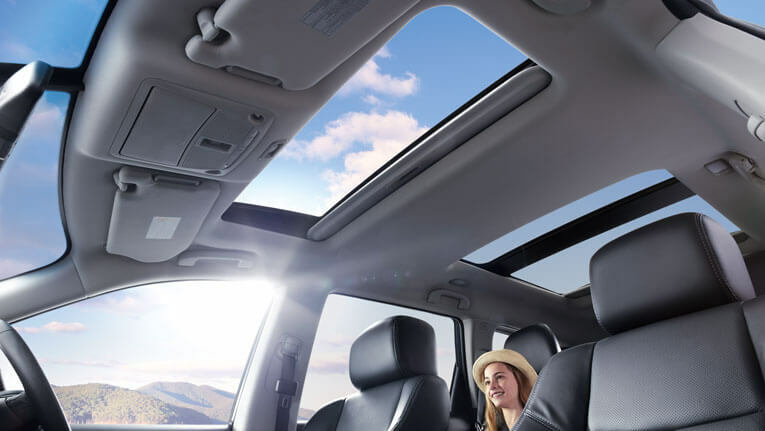 Large windows throughout and a panoramic glass roof* that brings natural light and scenery to your ride. Whether you’re in the city, on the highway, or cruising through the mountains, everyone can enjoy the scenery. Innovation that looks out for you. 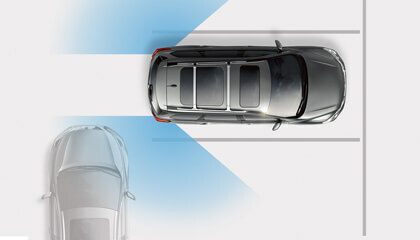 What if you had the confidence you need for every part of your drive? 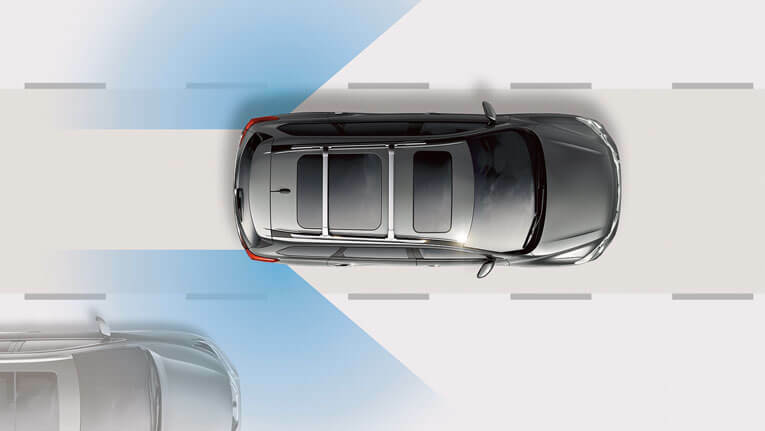 The Nissan Intelligent Mobility philosophy is a comprehensive approach to safety that guides the engineering and development of every vehicle we make. It helps keep an eye on your vehicle’s systems and surroundings, assists you in handling unexpected situations, and helps protect you in the unfortunate event of an accident. 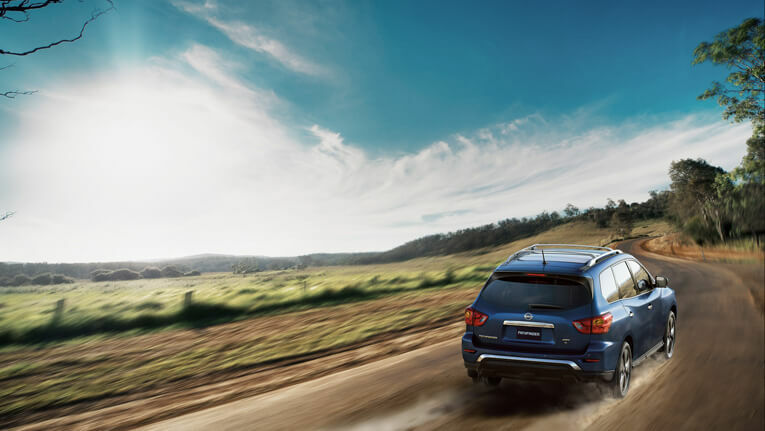 Unlike traditional systems that only maintain a set speed, the Nissan Pathfinder’s Intelligent Cruise Control* also helps maintain an adjustable set distance between you and the car in front. 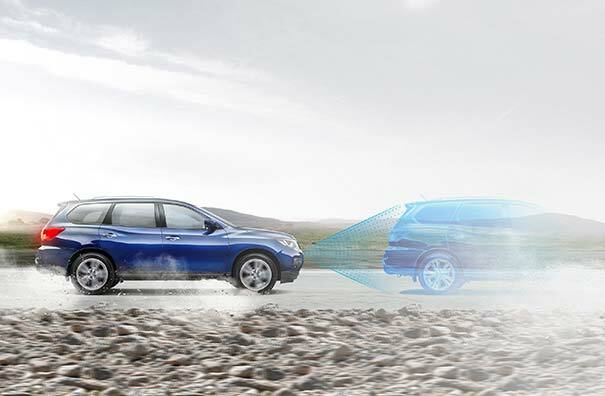 As traffic slows down or speeds up, the Nissan Pathfinder can respond accordingly. *ST-L and Ti models only. Driver’s aid only. Always monitor your surroundings when driving. 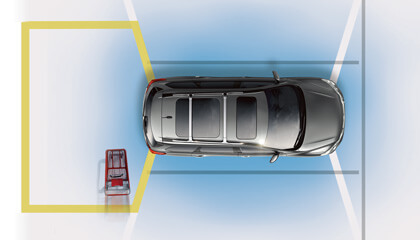 When it comes to parking, it’s nice to see more than just what’s directly behind you. 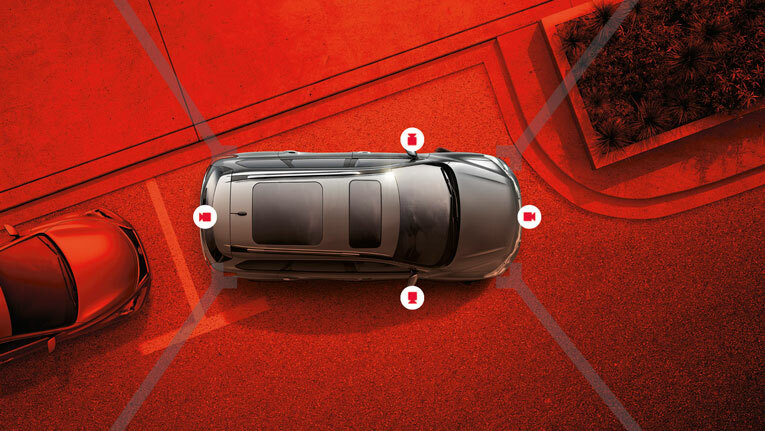 That’s why the Nissan Pathfinder with Intelligent Around-View® Monitor with Moving Object Detection* uses four cameras to give you a virtual 360˚ bird’s-eye view of your vehicle, with selectable split-screen close-ups of the front, rear and kerbside views. *ST-L and Ti models only. Driver’s aid only. Always check surroundings before moving vehicle. Using radar technology to keep an eye on your proximity to the vehicle ahead of you, Forward Collision Warning* can give you audible and visual display warnings to help you know when to reduce your speed. If required the Intelligent Emergency Braking will apply braking to reduce vehicle speed to avoid or reduce the severity of a collision. *ST-L and Ti models only. Ti model shown with optional accessories fitted. 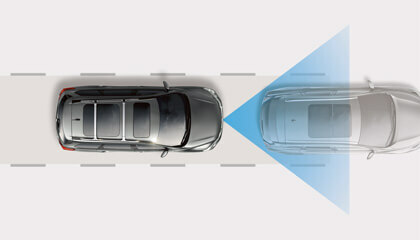 If another vehicle is detected in the blind spot area, an indicator appears in the driver’s or front passenger’s door pillar and on the Advanced Drive-Assist™ Display. Then, if you put your turn signal on, the indicator flashes with a warning chime. 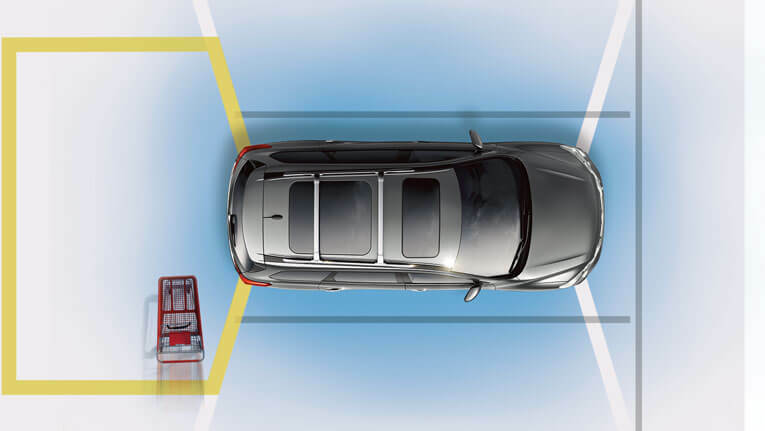 When you’re backing out of a parking space, this feature watches the area around the rear of your Nissan Pathfinder, and can warn you about vehicles detected that you might not see behind you approaching from up to 20 meters either side. When the Intelligent Around-View® Monitor* is in use, and moving objects are detected at the rear of the vehicle, it gives a visual and audible alert. 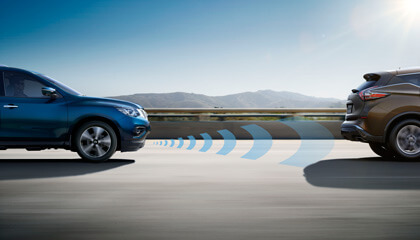 It’s hard to please everyone, but with tri-zone entertainment available on the Nissan Pathfinder Ti, you actually can. 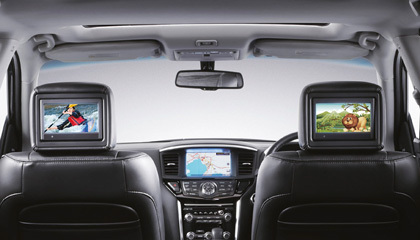 The rear monitors can play individually, giving a choice of DVDs, video games, photos, and more that you can control from the audio system’s 8.0" multi-touch screen. And for those at the back wearing wireless headphones, you can adjust the 13-speaker Bose® audio system* to play only in the front, letting you enjoy your own choice of entertainment in perfect harmony. 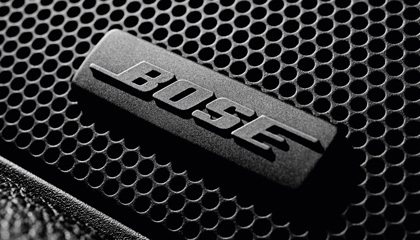 With 13 optimally-placed speakers and Acoustic Waveguide technology, the Bose® audio system fills the air with crisp, clear highs and rich, deep bass. 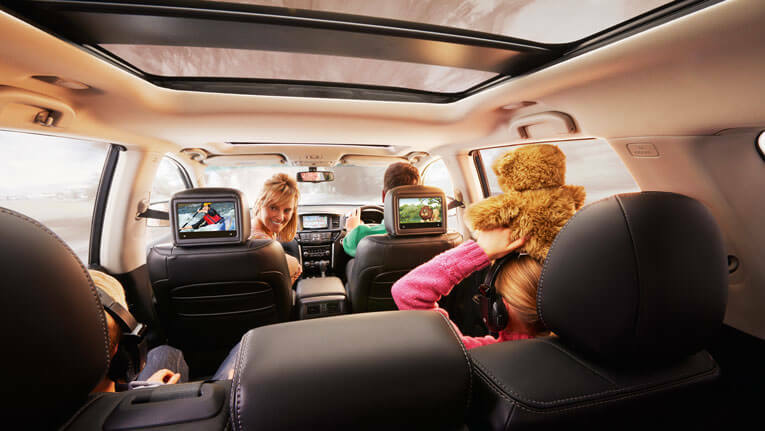 The rear monitors can play individually, giving a choice of DVD, video games, photos, and more that you can control from the audio system’s 8.0" multi-touch screen. It also comes with x3 USB ports, x1 HDMI port and x1 video/audio auxiliary port to connect all your favourite devices. 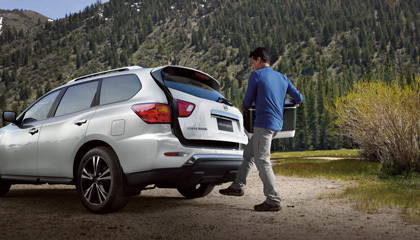 The Nissan Pathfinder’s power and efficiency combine to make every drive exceptional. It starts with a potent 3.5L V6 petrol engine that provides plenty of passing power. If ultra-efficiency is your goal, the optional hybrid^ 2.5L 4-cylinder supercharged petrol engine mated to a 15kW electric motor is the solution. This compact, torque-assist electric motor seamlessly works in tandem with the petrol engine to conserve fuel when starting up, coasting or stopping. Plus, the lithium-ion battery recharges automatically by converting kinetic energy from the braking vehicle, so you never have to charge it – brilliant! ^ST 2WD, ST-L 4WD and Ti 4WD models only. *Figures tested in accordance with ADR81/02 (combined test). Figures stated for the purposes of comparison amongst vehicles only. It is unlikely that this fuel consumption figure will be achieved in real world driving conditions. Actual fuel consumption depends on factors such as traffic conditions, vehicle condition, how you drive and any accessories fitted. Go ahead, bring your favourite toys. 340 Nm of torque delivers an impressive 2,700kg of braked towing capacity*, resulting in effortless towing of your boat, trailer, bike or caravan. 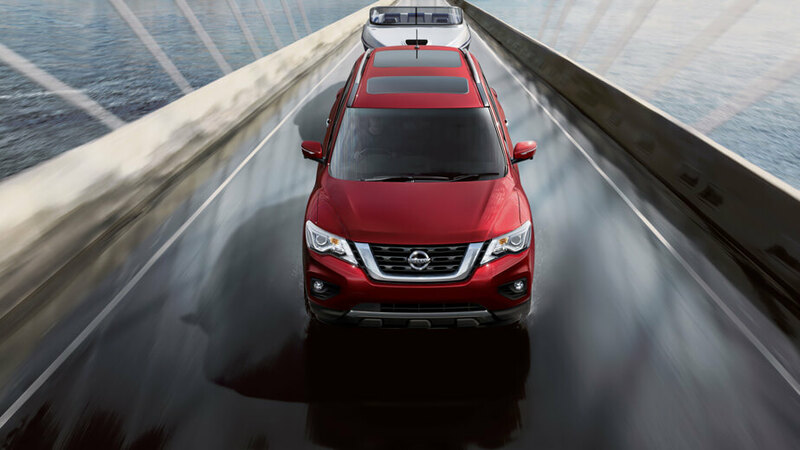 You name it, the Nissan Pathfinder has got it covered. *V6 models only. 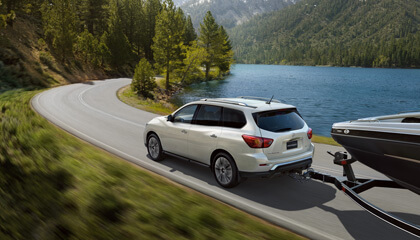 Towing capacity is subject to towbar/towball capacity and is based on the fitment of a Genuine Nissan towbar. 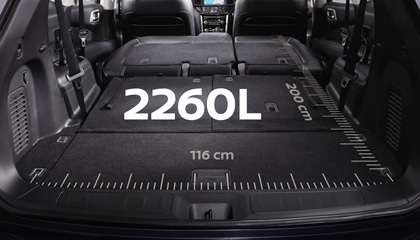 Towing capacity figure described is a maximum figure. Actual towing capacity depends on the laden mass of the vehicle, driving conditions, fitment of any accessories or towing equipment limitations including the maximum towball download. 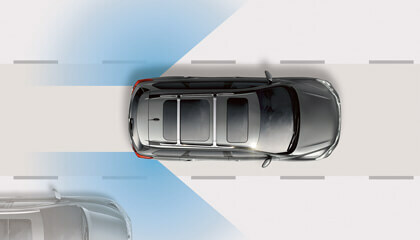 With the Nissan Pathfinder’s Intelligent 4x4 intuitive system*, you’ve got a vehicle that’s capable on-road and off. 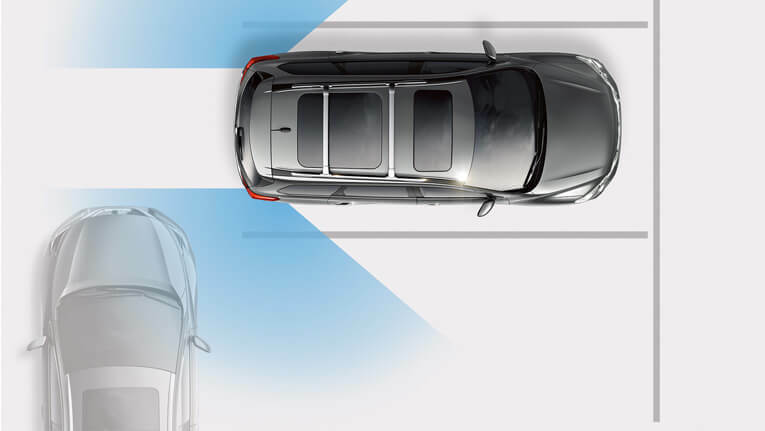 Choose full-time 2WD for maximum efficiency or switch on the Auto Mode that constantly monitors conditions and adjusts the balance of power between front and rear wheels for best traction. Challenging terrain? 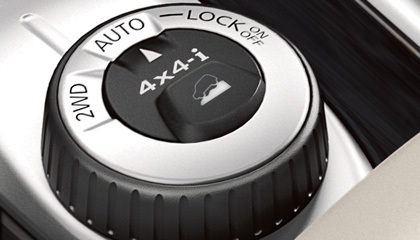 4WD Lock Mode is your choice. 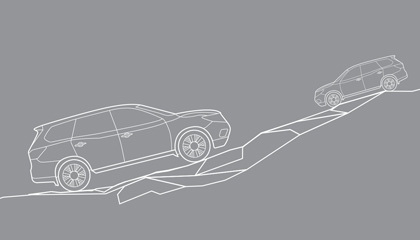 If your travels take you on steeper paths, Hill Start Assist helps prevent rollback when starting and driving away on an incline. On the way back down, Hill Descent Control* automatically controls your speed and brake pressure so you can keep your attention on finding the best path down. 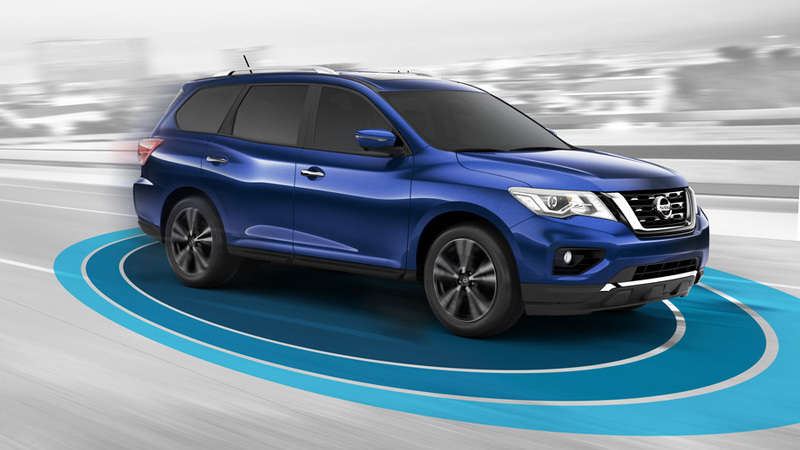 Enjoy the stares from the street in the Special Edition Pathfinder N-SPORT. 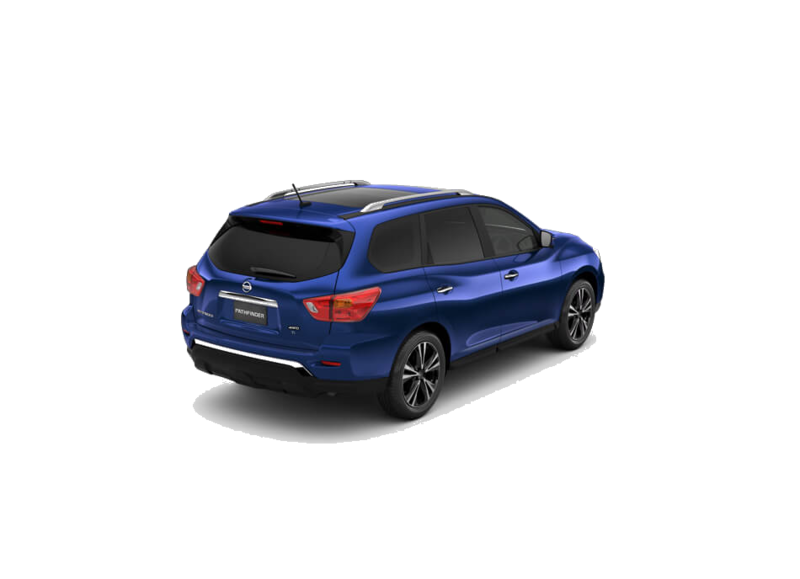 Featuring a stunning range of stylish improvements that include 20" black alloy wheels, black door mirrors, black roof rails,black V-motion grille, front and rear lower bumper accents. These blacked-out Roof Rails are sure to toughen up your next Pathfinder. 20" Black Alloy Wheels are sure to make a statement. Our signature V-Motion Grille gets a rugged redesgin. Maximum recommended driveaway price on vehicles ordered by 30/4/2019 and delivered within 30 days of end of month in which vehicle is ordered, unless offer extended. Premium paint available at additional cost. Excludes Government, Rental and National Fleet customers. Nissan reserves the right to vary, extend or withdraw this offer.